I've decided to take an easy approach to the twelve months ahead. For the last two years, I've latched onto the idea of choosing a word each January that represents what I'd like my life to be that year. Instead of making lists of resolutions that have finite ends, the One Little Word project evolves. As the year goes on, I learn more about my word, what it means to me, and how to apply it to my life. I struggle with it, I fail at it, and I pick it up and try again. Last year was especially tough. My word was calm. The most important lesson learned was that calm isn't something you find cowering under the bed. It's something you create. Throughout the year I learned to say "no" to make time to say "yes" in more important places. Creating white space in my head and in my home meant a calm family, and those moments did seem more common. The word I've landed on this year is simply. 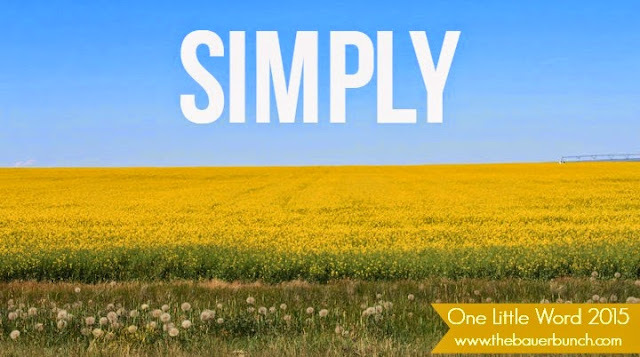 After tossing around several words to describe how I want to change and what I want to accomplish, the root of it all was this: I want to live simply and I want to simply live. I want to purge the junk, focus on what's important, and make the most out of each moment. I want to measure my life in memories, not time. I want to look at my children and actually see them. I want to do more of what I love and less of what I don't. I want to clear the clutter, breathe the fresh air, and just be. Stress and worries and the "busyness" of life can become so routine that I lose sight of my purpose. This year I am paring it down. I am focusing on the roles that mean the most to me, and building my life into its simplest form. This could result in new and exciting plans I can't even imagine now, but I think that's the point. Here's hoping, right? The best thing about this journey is that it comes with a promise to record it. Last year I vowed a monthly update and fell off the wagon in the summer. I'm going to attempt that again, with a new take on living simply each round. I'd also like to extend the challenge to you. Even if you don't do resolutions, this is an easy way to get a focus for your life. It's amazing how a series of letters strung together can inspire. I tried on various forms of my word: Simple. Simplicity. Simplify. But I couldn't get away from the adverb. My word is a descriptor of action, and I want it to describe the actions I choose to take in 2015. Simply is the way I want to live. How about you? Very good choice of a "theme" word for the year. Especially with the society we have today that is so go, go, go and becoming even more involved with technology and social media, etc. I like how you chose an adjective rather than a verb. Best wishes with your year! Love it. I want to live simply, too. I absolutely want to live simply too! My word for the year is eucharisteo.